Terry Lee Pendleton (born July 16, 1960) is a former third baseman in Major League Baseball, and a current coach of the Atlanta Braves. He played primarily for the St. Louis Cardinals and Atlanta Braves, but he also spent time with the Florida Marlins, Cincinnati Reds, and Kansas City Royals. During his fifteen-year career, he went to the World Series five times, yet his team never won a championship. Terry Pendleton started his baseball career as an Eastside Little League player, then moved on to play second baseman at Channel Islands High, then moved To Oxnard community college from 1979/80. Terry played on the very first Oxnard college baseball team in1979 and helped lead the Condors to a state championship berth then earning a scholarship and on to a collegiate baseball career at Fresno State. He played the 1981 and 1982 seasons with the Bulldogs, and was a key contributor to the team's fourth consecutive conference title in the 1982 season when he set a school record with 98 hits. That feat led to his recognition as an All-American. As a result, Pendleton had his jersey retired in 2007, alongside the jerseys of Tex Clevenger and Jimy Williams. He was drafted by the St. Louis Cardinals in the seventh round of the 1982 amateur draft, and subsequently signed with the team on June 12, 1982. With little haste after his signing, Pendleton's minor league campaign began with the Johnson City Cardinals and the St. Petersburg Cardinals during the 1982 season. Pendleton impressed the organization enough to warrant being moved up to class AA baseball with the Arkansas Travelers for the 1983 season. He was selected to the league's all star team for his performance at Arkansas. Making steady progress, Pendleton was promoted to class AAA in 1984 and played for the Louisville Redbirds. After four games at second base, Pendleton was moved to third and became a third baseman, the position he would play the rest of his career. The Cardinals were so impressed with Pendleton's development as a third baseman in Louisville that they traded their starting third baseman, Ken Oberkfell, to the Atlanta Braves and temporarily placed Andy Van Slyke at third base while Pendleton continued to gain experience. However, when Van Slyke committed seven errors in thirty games, the Cardinals promoted Pendleton to the majors and began his major league career as the starting third baseman. Pendleton made his major league debut on July 18, 1984 against the San Francisco Giants. Batting sixth in the lineup, he made an immediate impact, getting three hits in 5 at-bats en route to an 8–4 victory for the Cardinals. In 67 games during the 1984 St. Louis Cardinals season, Pendleton had a .324 batting average, 20 stolen bases, and finished tied for seventh in Major League Baseball Rookie of the Year Award voting. The 1985 St. Louis Cardinals season saw Pendleton remain in the starting lineup at third base. His batting average trailed off, as he only hit .240 for the season and was caught stealing 12 times to go along with 17 stolen bases for the season. The Cardinals advanced to the 1985 World Series, and Pendleton ended up hitting the Cardinals' only triple, doing so in the Cardinals' 3–0 game 4 win. His statline for the 1986 St. Louis Cardinals season was only modestly better. His batting average remained low at .239 and he only hit a single home run, but he was able to steal 24 bases, hit 26 doubles and 5 triples. St. Louis management became disappointed with Pendleton after this season, but manager Whitey Herzog pointed out to them that it was his baserunning and fielding (he led the National League in putouts and assists) that made him vital to the team's success. Pendleton answered front office criticism in his best season to date, the 1987 St. Louis Cardinals season. He improved in many statistical aspects in which he was struggling, including raising his batting average to a respectable .286. He was a strong contributor to the team's pennant win, placing second on the team in home runs, third in runs batted in, and tied for third in stolen bases. Pendleton's fielding efforts led to his earning his first Gold Glove, the first by a Cardinal third baseman since Ken Reitz in 1975, as well as finishing tied for 17th in MVP voting. Unfortunately, as the Cardinals reached the 1987 World Series to play the Minnesota Twins, Pendleton ended up sidelined for most of the series with a ribcage injury. Despite this injury, Pendleton's switch-hitting ability meant that he was able to be used as a left-handed designated hitter during three of the four games the Cardinals played at the Hubert H. Humphrey Metrodome. He finished the series by playing 3 games, getting 3 hits on 7 at-bats as the Cardinals fell in 7 games for the second time in three years. As the 1988 St. Louis Cardinals season began, Pendleton seemed to struggle where he had flourished. Despite earning 80 stolen bases in his first four seasons, he only stole three bases the whole season, and in fact went the rest of his career without stealing more than ten. Injuries also plagued him in 1988, as he missed a few weeks with a right hamstring injury, and had arthroscopic surgery in mid-September which cut his season short. Despite this, Pendleton hoped to rebound for the 1989 St. Louis Cardinals season. Rebounding was exactly what he did, as he played in all 162 games for the only times in his career, finished ninth in hits with 162, and earned his second Gold Glove with an impressive .971 fielding percentage. Despite an impressive 1989 season, Pendleton struggled during the 1990 St. Louis Cardinals season. His overall production decline that season, as evident by his .230 batting average and .277 on-base percentage, as well as splitting time with rookie Todd Zeile by the end of the season. After the season ended, Zeile appeared to be the third baseman of the future for the Cardinals, and Pendleton became a free agent. Pendleton is one of several major league players to have an error on a baseball card. His 1985 Donruss card lists him as Jeff Pendleton. After Pendleton was granted free agency on November 5, 1990, the Braves were undergoing a similar overhaul, as they acquired a new general manager in John Schuerholz. Assuming command of a last-place team, Schuerholz went to work and recruited half of a new infield by first signing Sid Bream to a contract, then getting Pendleton to sign a four-year, $10.2 million contract with the Atlanta Braves on December 3, 1990. With a new team and a new contract, Pendleton went to work by having a career year during the 1991 Atlanta Braves season, and led the Braves from a sixth-place finish the year prior to a division title, as well as a pennant. He had his best individual season, finishing with a .319 batting average and 187 hits, both of which led the National League. He also hit a career-high 22 home runs and a career-high eight triples. Despite his impressive statline, Pendleton was not selected for the All-Star Game. He was, however, named the National League MVP, edging out Barry Bonds by only 15 points. Pendleton also won the MLB Comeback Player of the Year Award due to his statistical improvements. Pendleton's statline in the 1991 World Series (a rematch for him against the Twins), the third series he played in, was also impressive. He went 11 for 30 and hit two home runs, starting at third for all seven games. In game seven of the series, Pendleton hit a double in the eighth inning that should have scored a run, however Lonnie Smith did not advance home, and a double play to end the inning kept the score at 0-0, leading to the Braves' eventual game seven defeat, and Pendleton's third game seven world series loss in a row. As the 1992 Atlanta Braves season rolled around, Pendleton remained in peak form. In 160 games, Pendleton had a .311 average, 21 home runs, and scored 94 runs. He had 105 RBIs, which ranked second in the National League and marked the only time he passed 100 RBIs in his career, and he had 199 hits, which was good for the National League lead, as well as a career high total. He also finished second in the National League in at bats with 640, earned his only bid to the Major League Baseball All-Star Game, and also won his third Gold Glove at third base (the first by a Brave third baseman since Clete Boyer in 1969) en route to the Braves making their second World Series appearance in a row. However, despite a 6 for 25 showing by Pendleton, the Braves fell to the Toronto Blue Jays in six games, losing all four games by one run. This marked Pendleton's fourth World Series loss in four attempts. Pendleton continued to produce extra base hits during the 1993 Atlanta Braves season, hitting 17 home runs and 33 doubles. However, he appeared to be showing signs of slowing down, as although he placed second in at bats with 633, he led the National League in outs with 490. His batting average of .272 was notably lower than his previous two seasons, and his luck did not fare any better as the 1994 Atlanta Braves season rolled around. He spent part of the season on the disabled list due to spasms in his neck and back, and after only hitting .252 for the season, opted for free agency. Pendleton was granted free agency on October 24, 1994, and was picked up by the Florida Marlins on April 7, 1995. Pendleton improved his batting average to .290, and hit 14 home runs while playing in 133 games. Pendleton went on to play 111 games for the Marlins in 1996, hitting .251 with seven home runs. After spending the 1995 and most of the 1996 on the Marlins, he was traded back to the Braves due to the Braves being battered by injuries. Right fielder David Justice was lost for the season with a shoulder separation in May, and shortstop Jeff Blauser suffered a broken bone in his left hand and missed some time. As a result, acquiring Pendleton meant Chipper Jones could play at his natural shortstop position while Pendleton played third. Pendleton was traded to the Braves on August 13, 1996 for minor league prospect Roosevelt Brown. He went on to play in the 1996 World Series, the fifth in his career. However, he was used only in a limited role en route to the New York Yankees beating the Braves in six games, leaving Pendleton 0-for-5 in his chances for a World Series ring. Pendleton as the Braves' first base coach, 2011. The Braves let him go after the 1996 season, and he signed on with the Cincinnati Reds on January 27, 1997. However, he was released on July 24, 1997, after hitting .248 with one home run and two stolen bases. He was released due to three stints on the disabled list, and instead of joining another club, he spent the rest of the season recovering. He signed on to the Kansas City Royals on January 20, 1998 with the club looking to provide leadership and mentoring for its younger players. Pendleton was used in a limited role, backing up Dean Palmer. He played 79 games in 1998, splitting time between the designated hitter position and third base. After the 1998 season ended, Pendleton retired after 15 major league seasons, deciding to spend more time with his family. After spending a couple years with his wife and three children, Pendleton got his first coaching job in November 2001 as the hitting coach of the Atlanta Braves. Pendleton served in that role through the 2010 season. In 2006 he was on a short list of people to replace Frank Robinson as manager of the Washington Nationals, only to withdraw himself from consideration a few weeks into the process. He was also reportedly one of the frontrunners to be the next St. Louis Cardinals' manager before Tony La Russa decided to stay with the Cardinals. He was a candidate to replace Bobby Cox when the esteemed Braves manager retired at the end of the 2010 season. 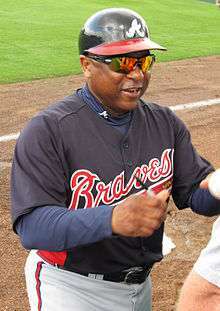 When Fredi Gonzalez was announced as Braves manager after the 2010 season, Terry Pendleton was moved from hitting coach to first base coach, replacing Glenn Hubbard. Gonzalez was fired and replaced by Brian Snitker in May 2016, and he chose Pendleton as bench coach. 1 2 3 4 Saladino, Tom (1996-08-25). "ATLANTA CAN CHEER PENDLETON AGAIN.". SPORTS. Los Angeles Daily News. Retrieved 2007-11-18. 1 2 3 "Fresno State Baseball Begins Season with Busy Weekend". Fresno State Athletics. 2007-01-10. Retrieved 2007-10-20. 1 2 3 4 5 6 7 8 9 10 11 12 13 14 15 16 17 18 19 20 21 22 23 "Terry Pendleton Statistics - Baseball-Reference.com". Retrieved 2007-10-20. 1 2 3 4 "Terry Pendleton Statistics - The Baseball Cube". Archived from the original on 2007-10-18. Retrieved 2007-10-21. ↑ "Class AA Notes". The Sporting News. 1983-08-01. p. 42. 1 2 3 4 5 6 7 8 9 "The Ballplayers - Terry Pendleton - BaseballLibrary.com". Archived from the original on 2007-10-18. Retrieved 2007-10-21. ↑ "July 18, 1984 San Francisco Giants at St. Louis Cardinals Play by Play and Box Score". Retrieved 2007-10-21. ↑ "1985 World Series Game 4 Box Score". Retrieved 2007-10-22. ↑ Chass, Murray (1987-10-16). "WORLD SERIES '87; Cardinals Won't Have Pendleton at Third for Series". New York Times. Retrieved 2007-11-18. ↑ "1987 World Series by Baseball Almanac". Retrieved 2007-10-22. ↑ Markusen, Bruce. "A baseball card mystery: Who is Jeff Pendleton?". TheHardballTimes.com. Retrieved 6 May 2012. ↑ Chass, Murray (1990-12-09). "BASEBALL; Free-Agent Signings in the Game of Catch-the-Leader". New York Times. Retrieved 2007-11-18. ↑ Chass, Murray (1990-12-04). "BASEBALL; McGee Signed by Giants; Expos Retain Martinez". New York Times. Retrieved 2007-11-18. ↑ "Pujols wins first MVP award". Retrieved 2007-10-23. ↑ "1991 World Series by Baseball Almanac". Retrieved 2007-10-23. ↑ Curry, Jack (1991-10-28). "WORLD SERIES; Pendleton Unable To Shake Dome Hex". The New York Times. Retrieved 2007-11-18. ↑ "1992 World Series by Baseball Almanac". Retrieved 2007-10-24. ↑ "Reds Release Pendleton". The New York Times. 1997-07-24. Retrieved 2007-11-18. ↑ "Terry Hangs It Up After 15 Years". CBS Sportsline. 1998-12-12. Retrieved 2007-10-25. ↑ "Team: Manager and Coaches: Terry Pendleton 9". Retrieved 2007-10-25. ↑ Svrluga, Barry (2006-10-06). "Nats Contact Braves About Pendleton". Washington Post. Retrieved 2007-10-24. ↑ Svrluga, Barry (2006-10-25). "Braves' Pendleton Pulls Out Of the Nats' Manager Chase". Washington Post. Retrieved 2007-10-24. ↑ "Braves to Hold Off on Announcing Skipper Replacement". Retrieved 2009-10-03. ↑ Walton, Carroll Rogers (January 25, 2011). "Terry Pendleton ready for new role as first-base coach". Atlanta Journal Constitution. Retrieved May 21, 2016. ↑ Bowman, Mark (May 18, 2016). "Pendleton, Perez discuss new roles, Snitker". MLB.com. Retrieved May 21, 2016. Wikimedia Commons has media related to Terry Pendleton.